Divorce is no stranger to Fleetwood Mac. The band, founded more than 50 years ago as a British blues ensemble, has survived an inordinate amount of personnel changes and internal turmoil yet remains an unfailing success as an arena band and the object of affection among fans from among at least three generations. Thursday night, the latest version of Fleetwood Mac visited the Sprint Center. A crowd in excess of 13,000 attended, knowing from the moment they purchased tickets that one of the band’s most beloved and elemental members had been fired: chief mastermind, Lindsey Buckingham. Back in April, the band announced they’d parted ways with the guitarist/songwriter. Lawyers have since gotten involved and lawsuits have been filed—just more nastiness within a band renowned for estrangements, departures, and internal acrimony. Nonetheless, the tour, as usual, went on. The band hired two absolute ringers to fill Buckingham’s large shoes: Mike Campbell, lead guitar slinger for the late Tom Petty’s band, the Heartbreakers; and Neil Finn, ace singer-songwriter and guitarist from New Zealand best known for his time in the bands Crowded House and Split Enz. Despite those top-shelf additions, there was much consternation over how this version of Fleetwood Mac would survive Buckingham’s second departure (he went on “hiatus” from 1987-97). The answer: just fine, though something definitely was missing. 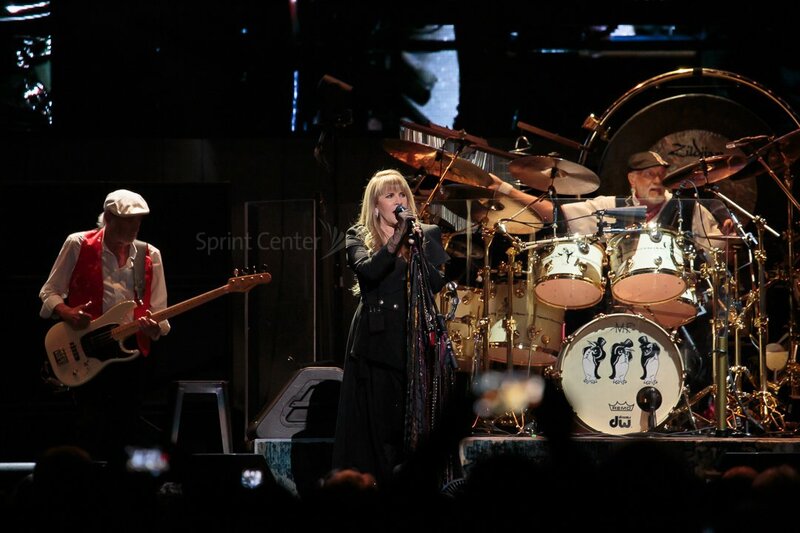 This six-piece version of Fleetwood Mac (Finn, Campbell, Stevie Nicks, Christine McVie, and founders John McVie and Mick Fleetwood) was fortified with plenty of backup help: two backup vocalists, a percussionist (perched amid a large drum kit aside Fleetwood), plus a keyboardist and third guitarist, both of whom also delivered vocal harmonies, adding luster and heft to nearly every song. Buckingham’s absence would not affect the set list much, a point made evident from the very first song, The Chain, a classic from the blockbuster Rumors album that is usually commandeered vocally by Buckingham. Not this time, though, and his absence seemed to matter little to the big, rowdy crowd, which sang along with gusto. From there, they bounced about from one hit to another: Little Lies, a porcelain pop hit from Christine McVie, to Dreams, a career-defining Nicks song, to Second Hand News, a Buckingham number that Finn handled vocally and which includes the line, “Someone has taken my place.” Zing No 1. Then Christine McVie delivered an on-point version of Say You Love Me, a timeless and perfect pop hit from the Fleetwood Mac album, now 43 years old. It’s worth noting that there were plenty of fans in attendance who were half the age of that album, even younger. This band keeps growing fans. One of the points of this tour, evidently, is to honor the Fleetwood Mac heritage and brand by visiting albums and songs that pre-date the Buckingham-Nicks days. So Nicks led the band through a rendition of Black Magic Woman, a song made famous by the band Santana but written and first recorded by Fleetwood Mac alum Peter Green in 1968. Campbell had no trouble re-creating Carlos Santana’s leads on guitar, and Nicks’ vocals were fine, but this exercise seemed unnecessary: a group with so many hits in its warehouse turning into a cover band playing a classic-rock radio staple. The rendition of the Danny Kerwin song Tell Me All The Things You Do, a lively but inconsequential rock-blues number, was equally as unsatisfying. Furthermore, they played nothing off the brilliant Tusk album—Buckingham’s crown achievement–which was a significant disappointment. They gave Finn a couple of big moments in the spotlight that paid off. First, he and Nicks performed the Split Enz new wave classic I Got You. Later, after a gracious introduction from Fleetwood, he serenaded the crowd, with some help from Nicks, with Don’t Dream It’s Over, a Crowded House number that, somewhat surprisingly, prompted a healthy sing-along. 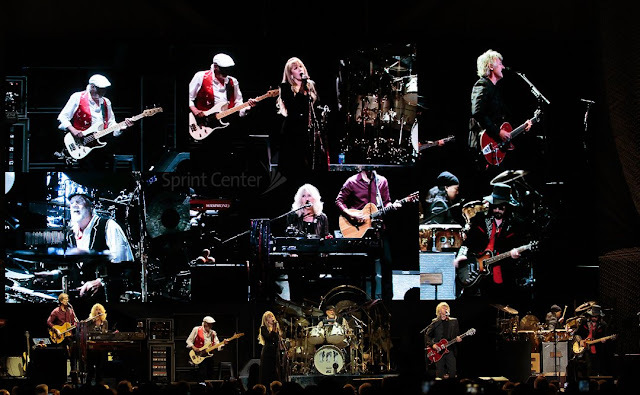 Nicks, still a rock-star heroine, delivered a few of the evening’s biggest and most memorable moments: Rhiannon, Gypsy and Landside, which never fails to turn a bustling arena crowd into a campfire sing-along choir. They brought the first set to a rip-roaring close with four blockbusters: Monday Morning, which Finn handled with ease, as if he’d written it himself; You Make Loving Fun, another Christine McVie pop tart; Gold Dust Woman, which was appended by an instrumental jam that went on too long; and then, depending on your perspective, a moment of blasphemy or bliss: Finn and Nicks barnstorming through Go Your Own Way, the definitive Buckingham-Nicks breakup song. As emotional as that was, that was just a warm-up for what ensued. For the first encore, Nicks, stepped up and sang one of Petty’s biggest hits, Free Fallin’. As the crowd roared back the chorus, the video screen behind the band broadcast portraits of Petty with Campbell, other Heartbreakers and Nicks. So bittersweet. They followed that with another Rumors blockbuster, Don’t Stop, which could easily be interpreted as a missive to Buckingham’s absence: Yesterday’s gone; don’t you look back. It ended the evening perfectly. For amid all the prevailing joy and warm reconnections to longtime favorite songs, there was also in the air a wistful sense that something profound was missing, but life was moving on. The Chain; Little Lies; Dreams; Second Hand News; Say You Love Me; Black Magic Woman; Everywhere; I Got You; Rhiannon; Tell Me All The Things You Do; World Turning; Gypsy; Oh Well; Don’t Dream It’s Over; Landslide; Isn’t It Midnight; Monday Morning; You Make Loving Fun; Gold Dust Woman; Go Your Own Way. Encore: Free Fallin’; Don’t Stop; All Over Again. Side note: Gypy was added to the set, Hypnotized and Storms still out. Umm, Black Magic Woman is a Fleetwood Mac song. It was Carols Santana who covered it. no Storms no Hypnotized.....why drop Always the new songs !!! !Why are so boring with the setlists?? ?Again Gypsy!!!!!why???? Black Magic Woman was originally a Fleetwood Mac song.